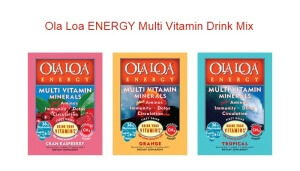 Get free samples of Ola Loa Drink Mixes. This freebie comes with sample packets of Ola Loa ENERGY packed full of multi-vitamins. I love getting free multi vitamin drink mix because they are much easier than pills. Ola Loa SPORT is packed full of electrolytes and antioxidants. To try his amazing product, scroll down the page and click on “free samples” in the left-hand corner of their webpage. List your name and address in the message box. Make sure to confirm the verification email to complete this freebie. Be sure to scroll down the page and click on “free samples” in the left-hand corner. Then be sure to read how to request the free sample once you get to their sample page!